In this topic you will learn how to customize the content of a live event in-page experience. 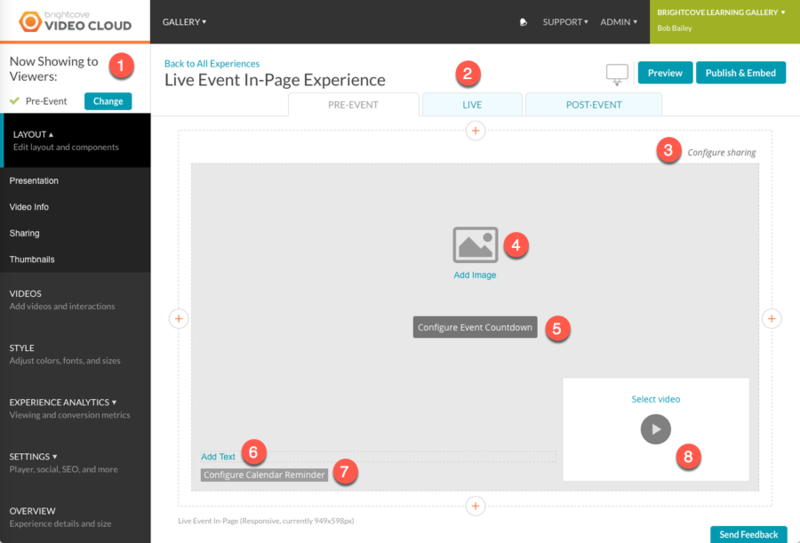 Gallery provides a Live Event In-Page template which can be used to deliver live events as part of an In-Page Experience. Brightcove offers numerous options for delivering live streaming video. See Delivering Live Streams for a list of all the options. For a detailed set of steps on using the Live module to broadcast a live event, see Quick Start: Using the Live Module with Telestream Wirecast. To create a new live event In-Page Experience, create a new In-Page Experience and select the Live Event In-Page template. The Live Event In-Page template has some settings and content items that are not present on the other In-Page Experience templates. 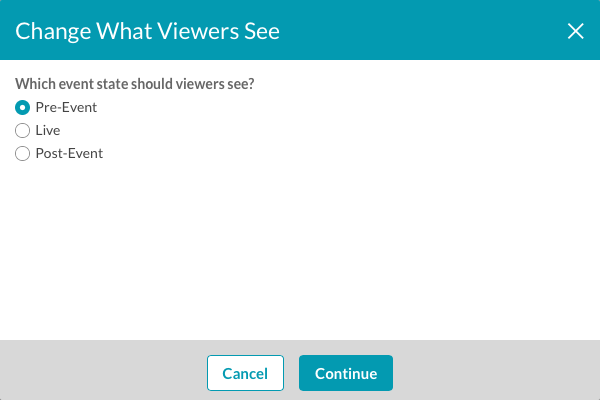 The Now Showing to Viewers setting is used to configure which live event state is displayed to viewers. Click Change and select the state that should be displayed. After changing this setting, the experience DOES NOT need to be republished however, it may be a minute before the state change appears on the production site. The experience states for a live event In-Page Experience are different than the other In-Page Experience types. The appearance of each of these states can be customized by clicking the links at the top of the page. To edit the different experience states, click a state and then add components to the experience as needed. The LAYOUT menu provides further customization options for each state. The social sharing options provide links to share the event and the videos to your social media accounts. 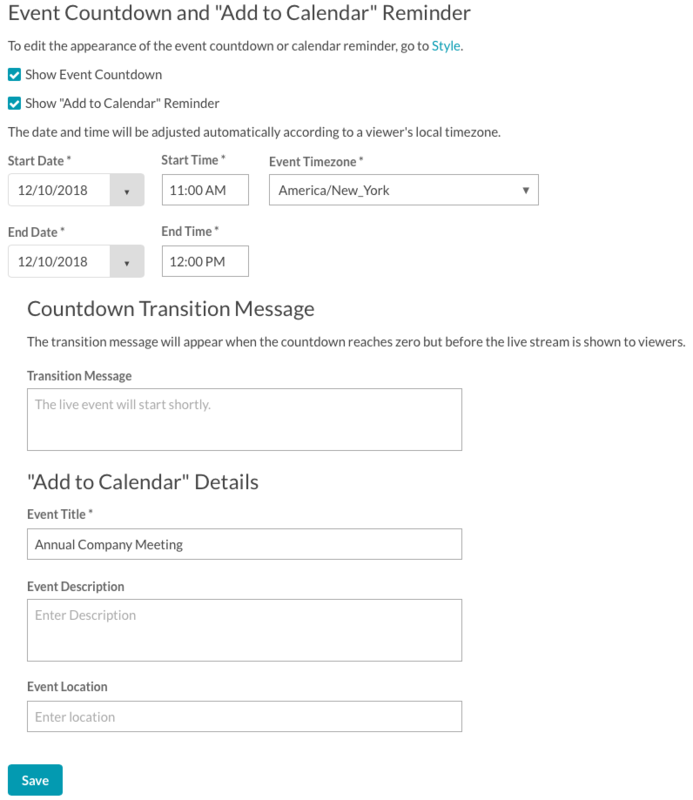 Enter an Event Title and Event Description. Choose how the event sharing options are displayed, Share text or display the social icons. Select the sharing options that are available. Enter the Page URL where the experience will be embedded. Click Generate. This will generate the meta tags that can be added to the <head> section of your page. 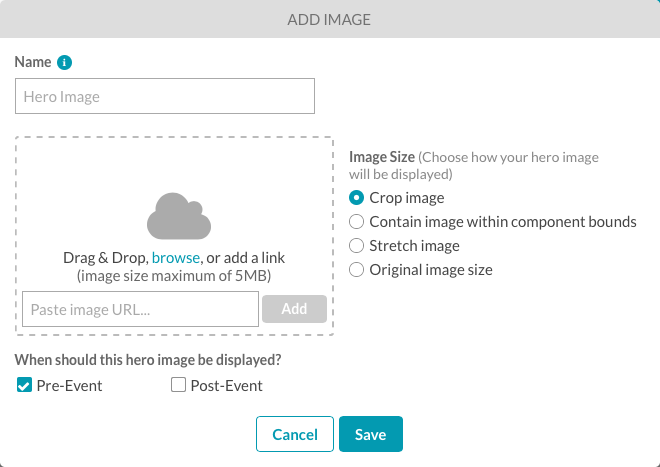 This feature will allow social sites to display the event image, title, and description when viewers share your experience. Choose how the video sharing options are displayed, Share text or display the social icons. The PRE-EVENT and POST-EVENT states provide the ability to display a hero image. Click the Add Image link. Enter a Name for the image. Select the states when the image should be displayed. Click Save to add the image to the experience. The countdown timer displays the number of months, days, hours, minutes and seconds before the live event begins. A sample countdown timer is shown below. Note: The style of the countdown timer can be styled by clicking STYLE in the left navigation. Click the Configure Event Countdown link on the page. The Event Settings page will open. 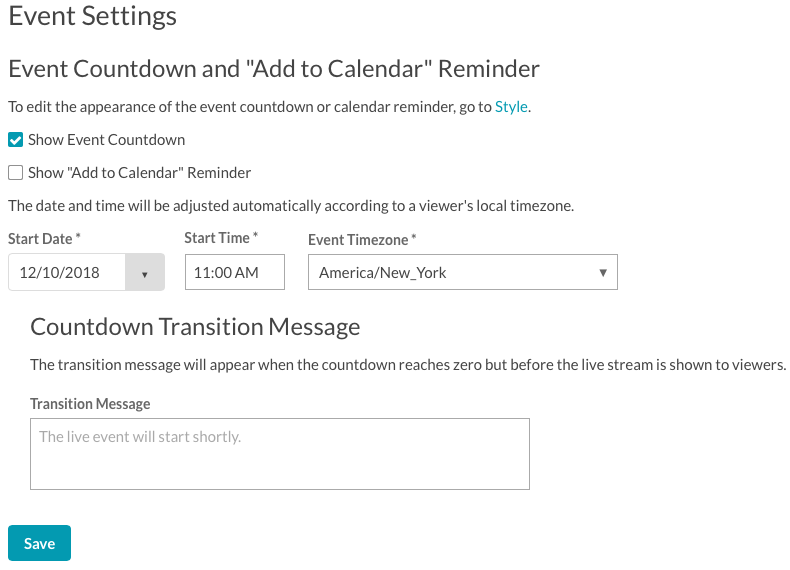 Set the Start Date, Start Time and Event Timezone. Enter a Transition Message. This message will be displayed when the countdown timer reaches zero but before the live stream begins. The PRE-EVENT and POST-EVENT states provide the ability to display static text. Click the Add Text link. Enter the text to add to the experience. The toolbar can be used to format the text. Click Save to add the text to the experience. A calendar reminder can be configured so users can click a link to download a calendar reminder. A sample calendar reminder is shown below. Clicking on the reminder will display calendar options. Note: The style of the calendar reminder can be styled by clicking STYLE in the left navigation. Click on the Configure Calendar Reminder link on the page. The Event Settings page will open. Check Show "Add to Calendar" Reminder. Set the End Date, End Time and Event Title. The Event Description and Event Location are optional. Note: The interface will appear slightly different if the Show Event Countdown option is selected. Different videos can be displayed during the PRE-EVENT, LIVE and POST-EVENT states. Video Cloud videos and YouTube videos can be added to the experience. Note: Before YouTube videos can be added to an experience, you must configure the YouTube settings. Click the Select video link or click VIDEOS in the left navigation. The Select a Video dialog will appear. 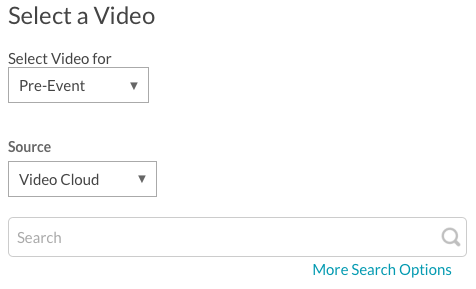 Search for a video, click on it to select it and then click Select. The video will be added to the video list. Click on the Live or Post-Event sections, or click Select Videos to select additional videos. Interactions and companion components can be added to pre-event and post-event videos and displayed as the video is played. Interactions include links and cards and are displayed as part of the player when a video is played. Companion components include HTML, images and text objects and are displayed outside the player. Note: Interactions and companion components are not available for the Live video unless it is a VOD asset. When the Live state is selected, a Video Cloud video ID or reference ID for the live video asset must be entered. The source for the live video will always be Video Cloud. 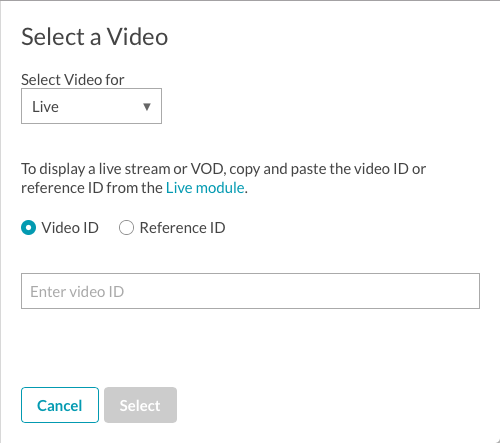 Selecting the Reference ID option allows you to change the reference ID for the live video in the Media module without having to change the video ID on the experience. For example, you may choose to denote the current live video with a reference ID of live-event. When creating the live experience, select Reference ID and enter live-event. 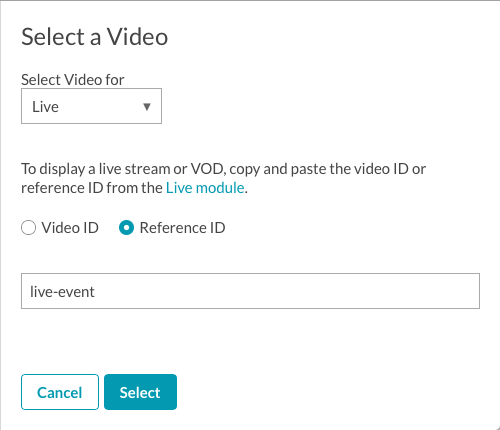 Now, whenever there is a new live event, use the Media module to set the reference ID for that video to live-event. By using reference ID, the live experience will not need to be edited and republished when a new event starts. When a new event is started, use the Media module to edit the video reference ID of the live video asset. 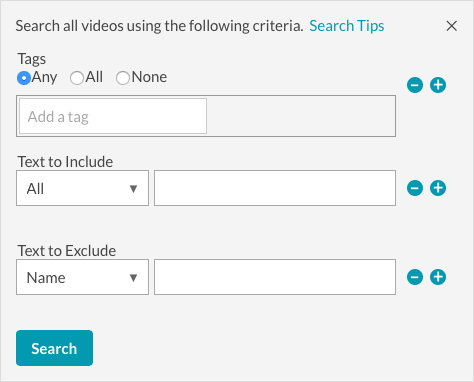 The Search field can be used to search for videos. 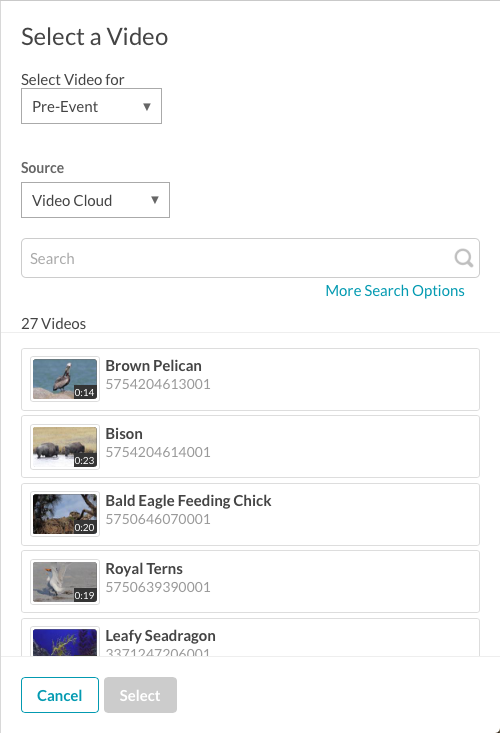 When searching Video Cloud videos, Gallery will search the video name, short and long descriptions, tags and custom fields. When searching YouTube videos, Gallery uses the YouTube search API. Click More Search Options for finer control over what fields are searched and to include and exclude text. 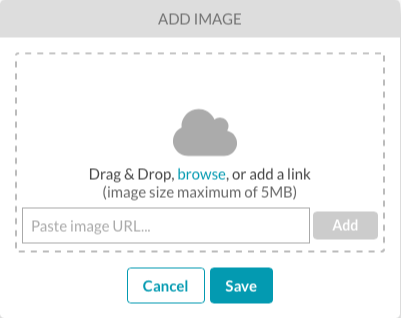 Note that this options is only available when a Video Cloud source is used.